Deruta is on the east of the E45 highway heading north, about 15km south of Perugia. 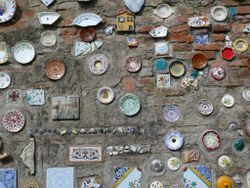 The many ceramics shops along the side of the road make it unmissable. Bus Line E012 goes from Piazza Partigiani in Perugia to the lower part of Deruta. Deruta has been producing pottery and ceramics since the 14th Century. Why pottery production is centered on this small town seems to be due to the quality of the local clay. Deruta reached its zenith in the 16th Century with much of its pottery drawing inspiration from the Renaissance and from painters such as Raphael, who came from nearby Gubbio. There are more than 300 ceramic firms in Deruta today and it is still possible to visit the artists at work in some of the smaller shops. The larger shops, along the main highway, mainly cater to passing coach parties but to buy the real thing you have to venture up into the hill town. Much of the production is still carried out as a cottage industry. Unbaked pottery is first baked in the ovens and then taken away to be hand-painted, before being returned to the ovens for glazing. The quality of the glaze is a particular feature of Deruta’s pottery. Piazza dei Consoli. Here can be found the Palazzetto Municipale (town hall), which dates from 1300. Its atrium houses a collection of neolithic and Etruscan archaeological finds. It also houses a collection of paintings taken from churches in the area and the Museum of Ceramics. Church of S. Francesco is opposite the town hall. It is in Romanesque-Gothic style. Pope Urban IV died in the adjacent convent in 1264.
finds. It also houses a collection of paintings taken from churches in the area and the Museum of Ceramics. Municipal Ceramics Museum. A vast collections of ceramics and "majolica", from the Middle Ages till now. Find the museum in a former monastery close to the main church in the historical centre. Torgiano with its wine and olive oil museums is a few km to the north. Perugia, a few km further, is a medieval university town that is definitely not to be missed. Famous cities like Assisi, Todi, Foligno, Bevagna, Spello and Spoleto are within 20-40 km, which makes Deruta ideal as a basis for a holiday in Umbria. This page was last edited on 21 September 2018, at 19:15.